The Los Angeles Department of Water and Power began covering the Ivanhoe Reservoir June 9 with floating black plastic balls known as Shade Balls. 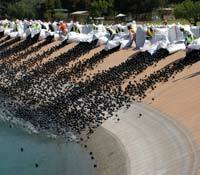 Los Angeles City Councilmember Tom LaBonge joined David Nahai, department chief executive officer and general manager to toss the first Shade Balls into the reservoir. Department crews finished the job by opening bales of the remaining 400,000 balls and releasing them en masse into the reservoir. "These balls will shade the water's surface, helping to prevent a sunlight-triggered chemical reaction with the treated water," Nahai said. "Nothing tops water quality on our priority list. We are on the record with this priority and we will stop at nothing to ensure our water is safe." Shade Balls will cover the Ivanhoe Reservoir until the Headworks underground water storage project in Griffith Park is online, projected at approximately 5 years from now. "The most important thing is to provide safe, high-quality drinking water to all Angelenos. As a Silver Lake resident, I know some people might not like their views interrupted by the Shade Balls, but we're confident that this is our best, most effective solution to the problem," said LaBonge. The department seeks to minimize the risk of bromate-forming chemical reactions. Shade Balls are 4-inch, hollow, shade-creating plastic balls that create shade without elaborate construction, parts, labor, or maintenance. The LA department is the first utility company to use them to mitigate a water quality problem in drinking water. Together with Silver Lake Reservoir, Ivanhoe Reservoir serves drinking water to approximately 600,000 consumers in downtown, central, and South Los Angeles.